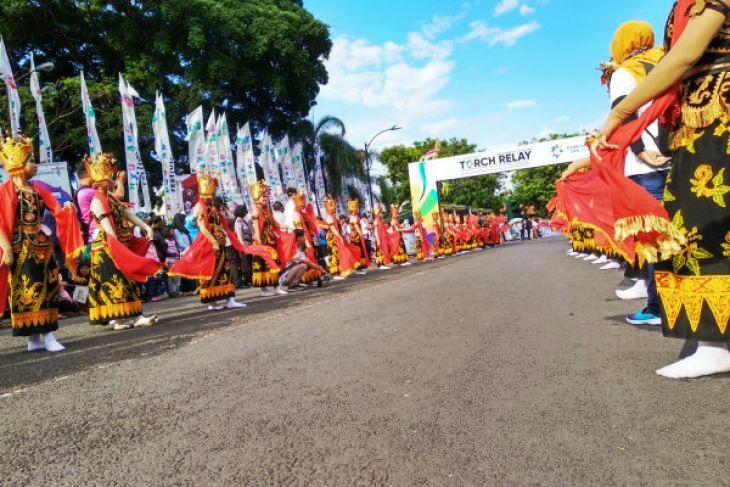 Community festival highlighted the Asian Games 2018 Torch arrival in Banyuwangi, East Java, on Sunday. Thousands of people packed the area around the hall of the district administration to see the festival including traditional music and dance performances to welcome the torch arrival. The chief of the Surabaya city police, Senior Commissioner Rudi Setiawan, handed over the torch to Banyuwangi district head Abdullah Azwar Anas who then lit a small cauldron set up at the district`s with it. The Asian Games flame had earlier been fused with the "blue fire" from the natural phenomena of the local Ijen crater, one of the top tourist destinations in Banyuwangi. The torch was paraded from Ijen to the city passing through a number of festivals held along the route including the traditional village of Osing tribe. "We welcome the Asian Games torch. This helps promote Banyuwangi tourism," Azwar Anas said. He said there are a lot of tourism spots to visit in Banyuwangi. "We have a mountain, beaches, traditional culinary and culture and others." The Asian Games torch was paraded by bike from Ijen to Diponegoro stadium before being taken to the hall of the district administration office. Several athletes and former cycling athletes such as Dadang Haris Purnomo and Fathurrohman, Nurochman (athletic) and Donny Kusuma (softball) were involved in the parade. The Asian Games torch relay was started in Yogyakarta in Central Java and has so far passed Solo (C Java), Blitar, Malang, Bromo, Probolinggo, Situbondo and Bondowoso in East Java. After Banyuwangi, the torch would be taken eastward to Bali and then Lombok and other cities before being used to lit the cauldron at the Gelora Bung Karno stadium in Jakarta to mark the opening of the Asian biggest sporting event. The torch of the 18th Asian Games arrived at the Adi Sutjipto Air Force Base in Yogyakarta, Tuesday, at 8 a.m. local time from India aboard a Boeing 737-500 aircraft of the Indonesian Air Force. The relay began on July 15 at the Major Dhyan Chand National Stadium in New Delhi, host of the first Asian Games. The flame was generated from a parabolic mirror directed straight at the sun. The relay in Indonesia will end on Aug 17, the country`s Independence Day, at the National Monument, Jakarta, before being carried into the opening ceremony at the Gelora Bung Karno Stadium on the following day.